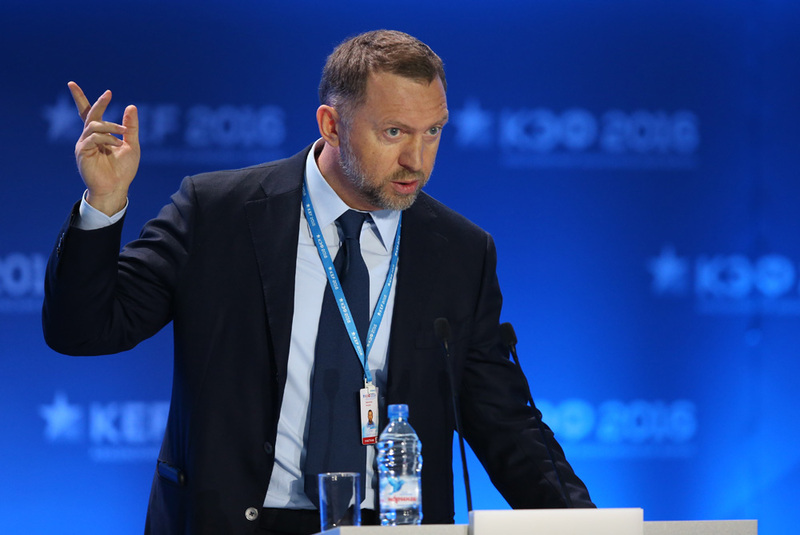 Rusal President Oleg Deripaska speaks during a panel discussion titled "Russia – Asia. Increasing the Flow of Mutual Investment" as part of the 2016 Krasnoyarsk Economic Forum, Feb. 19. The summer of 2016 should see the publication of Strategy-2030, a blueprint for the country's future development over the next 15 years. From Feb.18-20, leading Russian economists presented the highlights of the project at the Krasnoyarsk Economic Forum in the central Siberian city of Krasnoyarsk. Since the 2000s, all taxes in Russia have been allocated through the federal center, making Moscow the fastest developing city in the country. In future, everything will be different, according to Strategy-2030. Moscow's economy has been growing mainly through the development of the services sector. However, with GDP weakening along with falling oil prices, this potential has already been exhausted. Now it is necessary to create incentives for moving people from services to other sectors of the economy. "Each time I come to Moscow, I wonder what all those people do," said the businessman, most of whose assets are located in Siberia. If in the 18th century agriculture was the most advanced sector of the economy, in the 19th and the 20th centuries it nearly became the most backward. The explosive growth of the Soviet economy in the 1920s-60s was largely driven by labor's relocation from rural areas to towns and cities in search of work. The modern economy, however, works differently, and the agricultural sector can become a source of new technologies no less than the IT sector can, according to the participants of the forum. According to futurologists' forecasts, the next technological revolution will take place in food, thus a focus on the agricultural sector will help Russia to make a timely switch from a natural resources-based to a food economy. Since Russia is the biggest country in the world, it could become a real testing ground for developing agro-industrial technologies. This thesis was succinctly summed up at the forum by Russian Deputy Prime Minister Arkady Dvorkovich: "Russia is already heating the world, Russia can feed it too." The main development institutions in Russia are its state-owned banks: the country's biggest lender Sberbank, its competitor VTB, and VEB, which was set up to finance infrastructure projects. As a result of Western sanctions, these banks, which financed the 2014 Winter Olympics in Sochi, have found themselves cut off from the world capital markets. As Oleg Deripaska pointed out at the forum, a couple of banks "cannot save the whole of the Russian economy” – there should be at least eight of them. New major banks could be set up by leading businessmen and could be headed by former government officials who will lose their jobs as a result of streamlining government structure and spending. This should be followed by a complete outsourcing of state functions, for example in education and the social sphere a growing part should belong to NGOs. Another key area of discussion at the Krasnoyarsk Economic Forum was healthcare. In developed countries, one of the biggest items in healthcare spending is treatment of Alzheimer's disease. Not so in Russia, where people do not live long enough to develop Alzheimer's and mainly die of various cardiovascular conditions. Disease prevention is the main development area for medicine of the future. Doctors should no longer treat diseases, they should prevent them. In this respect, it was proposed at the forum that Russia could follow France's example. Despite a not particularly long working week (45 hours instead of the United States’ 70) and not a very big population, France has been able to create the necessary technologies. The main reason is its reliance on education. "The French have a superior education system, although they are not particularly great workers and enjoy a sybaritic lifestyle," said academician Alexander Kuleshov, speaking at the forum. The article is based on reports by the vice-chancellor of the Russian Presidential Academy of National Economy and Public Administration, Vladimir Mau; academician Alexander Kuleshov; author Alexander Arkhangelsky; Rusal president Oleg Deripaska; and Russian Deputy Prime Minister Arkady Dvorkovich.